We’re back in Arcadia Bay for another episode of Life is Strange Before the Storm – a game that gives you an understanding of young love and teenage angst. Now there’s no point in reading this review if you haven’t played the first episode – so stop right now if you haven’t, because I might just head into spoiler territory. Good, all the right people here? I will begin. So in the first episode we were introduced to Chloe and her rebellious ways. Haunted by dreams of her dead father who had a very unfortunate car accident, and living in a house with a horrible alpha male soon to be her stepfather, Chloe is having a rather rough time of it. She is failing at her school, getting in trouble with drug dealers and then, as she meets Rachel, her world turns upside down. Rachel is a good student, brilliant actress and someone who Chloe thinks is very cool indeed. A romance develops and they bunk off school together, only to discover that Rachel’s dad is having an affair with another woman. This prompts Rachel to start a terrible fire and that’s where we left our intrepid duo at the end of Episode 1. The chapter was brilliantly written, and had some nice interesting side missions, but it still had a major pacing problem. Now with Episode 2 we start back with Chloe being called into school to deal with her absent day off with Rachel. There are some terrible consequences from their actions and Chloe has an emotional row with her mother and soon-to-be stepfather. Chloe is asked by her drug dealer to do a job for her that involves stealing something from one of the students. This goes badly wrong and you have some important decisions to make. There is a production of The Tempest that you are directly involved in, with some very emotional sweet moments. Then a dinner party where a home truth is revealed finishes the episode on a cliffhanger. But how does it all shape up? I’d like to start by talking about the negative aspects first and getting it all out of the way before focusing on the positive stuff. 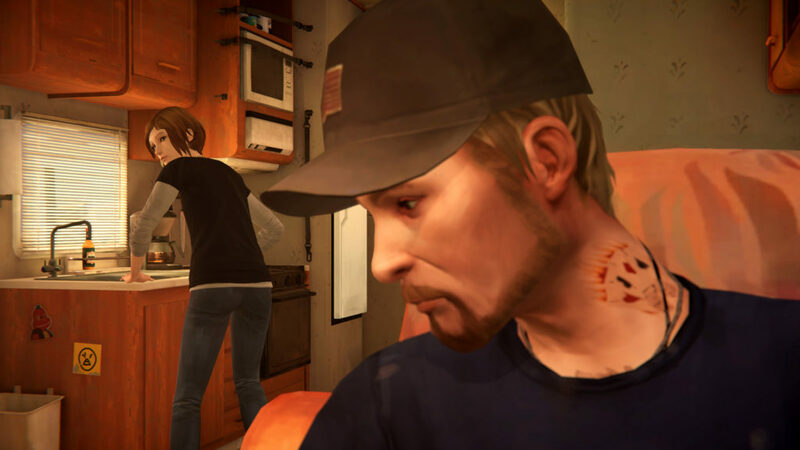 My biggest problem with the Before the Storm is in the pacing and editing of the game. Yes, it’s great to have a flowing rhythm to the conversations and realistic close ups on faces for a long while, but that rhythm gets repeated too many times for my liking and starts to become stale. Also the tension in scenes can dissolve or get lost in certain situations, where it should be ramping up. 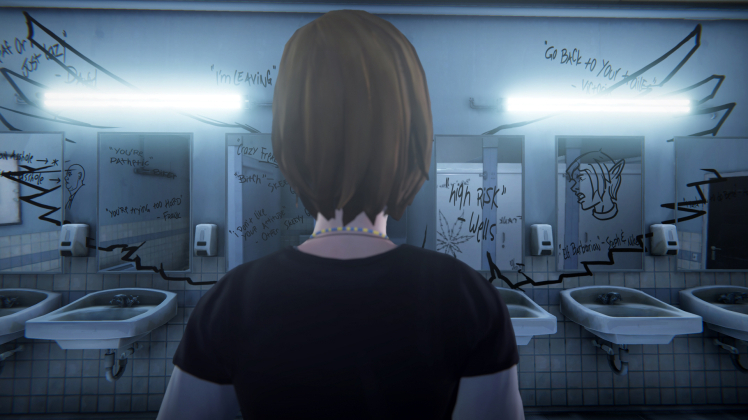 In the first episode, the game introduced a great system whereby Chloe used a sort of tug of war system of insults to persuade or influence a character to her whims. This is back, but it doesn’t feel as effective as first time out, and at times comes across as a bit redundant. It also had a couple of set pieces, like the roleplaying section, that gave the game a lightness and inventiveness to aid the main story. I feel now that those great set pieces are missing, apart from maybe within the Tempest play section. It just doesn’t feel the same. But enough of the negatives, let’s drink on the positive, because there are lots of good things to be found in this well crafted game. The writing, which is the crux and heart of this series, is still excellent and brilliantly shaped throughout. The one liners, the character breakdowns and the weighty conversations are on the top of their game. Where else can you find a game that is a romantic drama about teenage life in small town America? The puzzles are nicely shaped as well, not too tricky, but there are some decent brain teasers in there as well. The well of detail in the things you can find along the way, that add sub stories and little side narratives is delightful. Then we have the excellent voice acting and amazing indie soundtrack that is expertly placed into key scenes and dramatic moments. The design and graphical quality of the episode is still of a very high standard too, with the colours pinging off the screen. 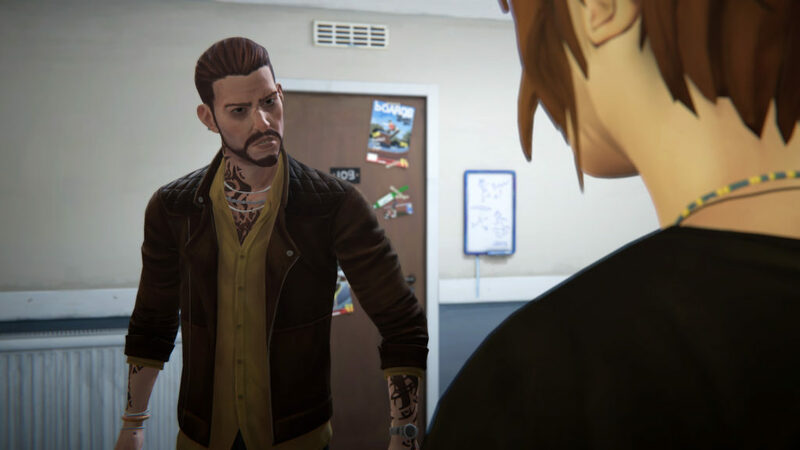 Sometimes the facial expressions can die a little and look a tad bland, but in short the quality of Episode 2 of Life is Strange: Before the Storm is high. In fact, the standard of this second episode feels like a traditional Act Two. It’s not quite as good as the first, and is hopefully sitting here just to bridge the gap that is leading to an exciting final third. The pacing will hopefully get better and I would like to see more innovative set pieces like those found in the first episode, and a bit less of the chat. But the quality of presentation, writing and voice over is as brilliant as ever and the point and click adventure is still very good. I am now waiting with anticipation rather then dread for the next and final episode in this prequel saga. Please be brilliant. Next articleMetal Gear Survive Xbox One, PS4 and PC release date, pre-order bonuses and more detailed!